He glanced at the sky and noticed the moon was sinking, so thought it time to make haste, as perhaps his mother may be looking for him by now. Past the gum-trees and thick bushes he scrambled, and just as he reached a clearing in the trees he paused to listen. Quietly he tiptoed into the grass, and suddenly stood quite still. In front of him, not many yards away the crickets were holding a cricket match. Blinky chuckled as he looked at them. The batsman had a leaf for his bat, while the bowler had a spider’s cocoon for a ball. They were too interested in their game to notice Blinky; but he missed nothing. A deafening chirruping rent the air. Most of the spectators were perched on the blades of grass, as high up as they could climb, and were waving their legs in the air, and shaking the grass they stood on. 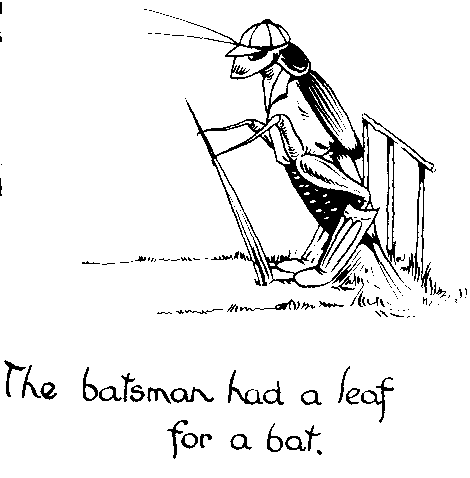 The batsman had a leaf for a bat. “He’s bumping the ball!” they shrieked in cricket voices. “Pull him out! Pull him out,” they shouted, and at once the umpire hopped over to the bowler and soundly boxed his ears with his front leg. The bowler lost his temper, and jumped on the cricket ball, breaking it in pieces. “Shame! Shame!” shouted the crickets. And in the next instant they surged on to the ground. 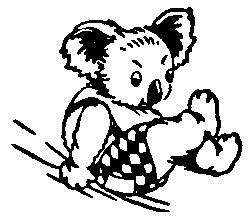 Springing in the air they pounced on him and gave him a terrible kicking; and as Blinky turned to walk away he saw them piling earth on top of the bowler. “I must hurry now, as I’m sure it’s getting late,” he thought, and he was beginning to feel very shaky. What if his mother found he was missing. That Mrs Grunty could be very cross at times, and she might persuade his mother to use a stick round his hind parts, as she once suggested. In his haste he stumbled over a stone and hurt his foot, so sat down to wait until the pain left him. Just behind the stump he was sitting on, a rabbit had made her home, and as she came scurrying through the grass she did not notice Blinky sitting so quietly. Between her teeth she carried some flannel flowers and a sprig of boronia. 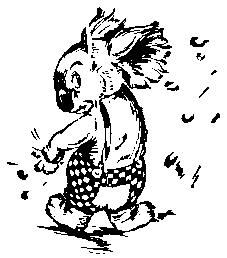 “You’re Blinky Bill, and my mother knows your mother,” said the rabbit. “What’s your name?” Blinky asked. “That’s a silly name,” said Blinky quite rudely. “What does suitable mean?” Blinky asked. “What does she do when you run away?” Blinky asked rather anxiously. “Well, where have you been, and why have you those flowers? 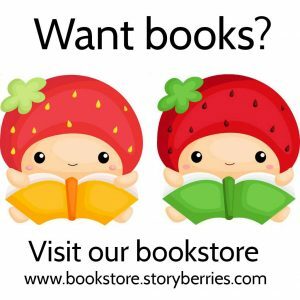 You look very stupid carrying them in your mouth,” Blinky remarked. Bobbin hopped about with glee and twitched her ears in a most surprising manner, while Blinky’s eyes bulged with excitement. “Could I come to the party?” he inquired breathlessly. “You haven’t a present to bring!” Bobbin answered. Bobbin looked at his ears and considered the matter for a moment. It sounded rather a muddle to Blinky; but he was prepared to take any risks if only he could get to the party. “Could we go now?” he inquired anxiously. 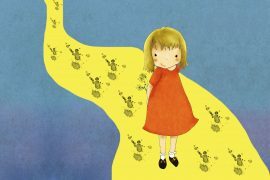 “Yes, but wipe your feet on the grass, before we go inside, as mother’s been cleaning all night long,” Bobbin advised. Blinky did as he was told, and followed Bobbin through the doorway. Fortunately for him the burrow was a large one, so he had no difficulty in crawling along. “Isn’t it dark!” he said in a frightened voice. “You’ll soon get used to that,” Bobbin replied cheerfully, as she padded ahead. “Do you hear the scraping and thumping? That’s the party,” she said excitedly. “What are they doing?” Blinky asked. In and out of passages they ran, round corners, up and down, and at last came to a large cave. 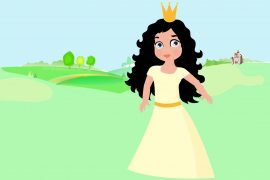 The floor and the walls were bare earth, but over the ground a carpet of grass was spread, and the ceiling was bright with flowers. From the centre a bunch of Christmas bells hung, and directly underneath, the table was spread with all the party cakes and drinks. In the middle of the table a birthday cake stood, glittering with dewdrops that fell from the flowers surrounding it. It was made from corn husks and thistledown, so you can imagine how crunchy it must have tasted. 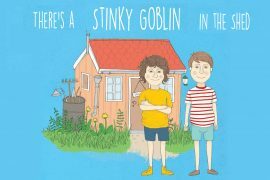 As Blinky and Bobbin appeared the guests stood and gazed in wonderment; their large brown eyes opened very widely and nervous noses sniffed the air. “You’re very welcome, I’m sure,” kind Mrs Rabbit said, as she took Blinky’s paw. “Come along and meet my friends. This is Madam Hare; shake paws with her. She is very shy, but is an old friend of mine; and this is Brer Rabbit, my husband, who is a great hunter; and here is Bunchy, my son, whose birthday it is.” Each one shook paws with Blinky, and he wondered if it would ever come to an end, and the party start, as he was feeling very hungry and wanted to taste those gum-tips. Bunchy thought it great fun to have a bear at his party and followed Blinky wherever he went. “You’ve lost your tail!” he said in surprise as he hopped round him. “Don’t wear a tail,” Blinky mumbled. “Why does everyone pass remarks about my tail or my nose,” he wondered. “Tea’s ready,” Mrs Rabbit called. And everyone made a rush for the table. “Don’t rush, and don’t grab,” Brer Rabbit thundered in a loud voice. Madam Hare may have been shy, but Blinky noticed she reached the table as soon as he, and rather rudely pushed her way right beside Brer Rabbit. “The bold hussy,” someone whispered and gave her tail a nip. 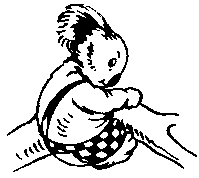 She gave a little scream and spitefully bit the ear of the rabbit who sat next to her; but it wasn’t Brer Rabbit’s ear. The party went on pleasantly after that command. Everyone nibbled and munched, except Blinky who forgot his manners completely and gobbled the gum-leaves as fast as he could. It was just as well nobody else liked them, for in a very short time they had all vanished. The cake was a great success and Bunchy handed a piece to each guest, quickly taking a nibble from one or two when nobody was looking. His mother gave him a sharp nip on the ear when she found him poking his paw in the dandelion milk, and slyly sucking it when he thought he was safely hidden from view. “No, mother,” said Bunchy obediently, and he hopped to Madam Hare and handed her the milk. “So do I,” remarked Bunchy as he hopped away. “What’s that? What’s that?” said Brer Rabbit in between mouthfuls of grass salad. “Father, you’re speaking with your mouth full; and it’s so bad for the children to see,” gently reprimanded Mrs Rabbit, much to Blinky’s amusement, as his mother had often corrected him for exactly the same thing. “Can’t we have games, Mrs Rabbit?” he asked when at last he sat before an empty plate. Everyone helped, and Blinky gave Madam Hare’s tail another pull as he passed her with an armful of grass. Nobody seemed to take any notice of Madam Hare’s complaints, and Blinky and Bunchy both agreed to give it another pull later on in the evening. When the last piece of grass was cleaned from the floor Mrs Rabbit clapped her paws three times and a dozen large locusts appeared out of the ground. It was a surprise, as nobody expected anything like that to happen. “Who are they?” Blinky whispered to Bobbin. “That’s the orchestra,” she cried jumping up and down excitedly. Each locust walked to a corner of the cave and quietly sat down with an expectant look on his face. The conductor, who was a “double drummer”, scraped his hind legs on his wings. “Gurra-gurra-gurra” Came the vibrating notes. That was the signal, and instantly all the other locusts started scraping their legs. “Girr—girr—girr—gurra—gurra—gurra.” The cave echoed with the drumming noise and beads of perspiration rolled down the conductor’s face as he worked himself up (or down, to be correct) to a slow deep “Gurra”. The air throbbed with the music. It was really inspiring, and soft furry rabbit feet began to thump the ground. Lady rabbits looked coyly at the gentlemen, and odd little twitches of the ears and twinks of the whiskers were to be noticed. “Take your partners for ‘The Bunny Hug’,” Brer Rabbit called in a deep voice. There was a scampering and rushing, as each rabbit grabbed a partner. 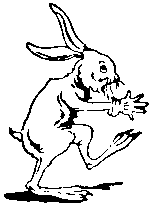 Madam Hare didn’t even wait to be asked to dance, but seized Brer Rabbit in her arms and began rolling from one side to the other, also jerking her arms up and down in a forward manner. “That Madam Hare is not as shy as I thought she was,” murmured Mrs Rabbit as she was led away by an elderly partner. Blinky was delighted. His very first dance. Now he would have something to tell Snubby when he reached home. Taking Bobbin in his paws he rolled from one side to the other, just like Madam Hare, whom he kept watching closely. “You’re treading on my toes,” whimpered Bobbin. Blinky looked down at her paws quite alarmed. “Your toe-nails are too long,” he said rudely. Bobbin began to giggle, as she did not like Madam Hare a bit. She “showed off” such a lot. 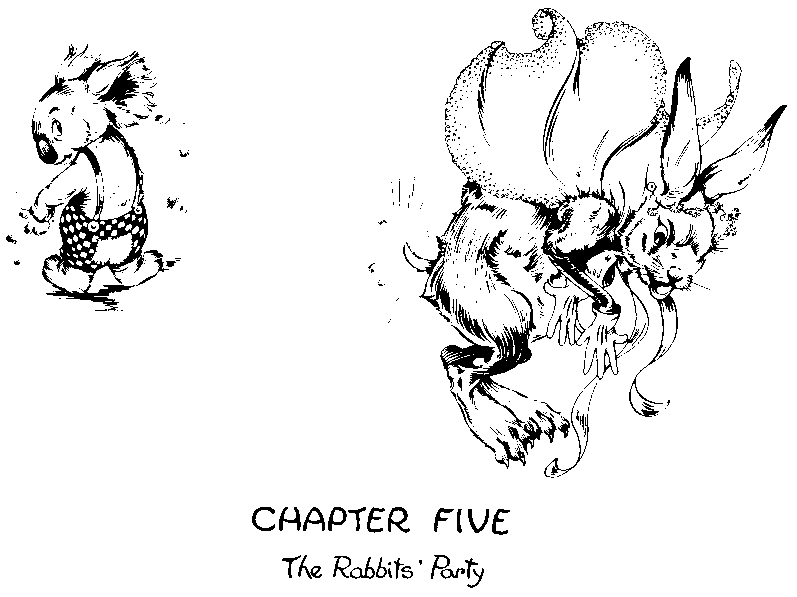 As the dancers neared Blinky he cautiously grabbed Madam Hare’s tail and gave it a very hard pull, so hard in fact that a pawful of fur flew into the air. Before Madam Hare knew what she was doing, she boxed Brer Rabbit’s ears. He was astonished, and looked very pained. “Did you pull my tail?” Madam Hare demanded in an angry voice. That was the end of everything for Madam Hare. She hopped right into the middle of the floor and kicked every one as they passed in their dance. It was the beginning of a wild fight. Fur flew through the air, teeth gnashed. And, oh, the savage kicks! Everyone kicked, and the dust began to make them sneeze and cough. The orchestra made a gallant attempt to soothe the ruffled dancers, and dinned louder than ever; but the scuffle grew worse. Bobbin thought it time to tell her father who it really was that had caused all the trouble. 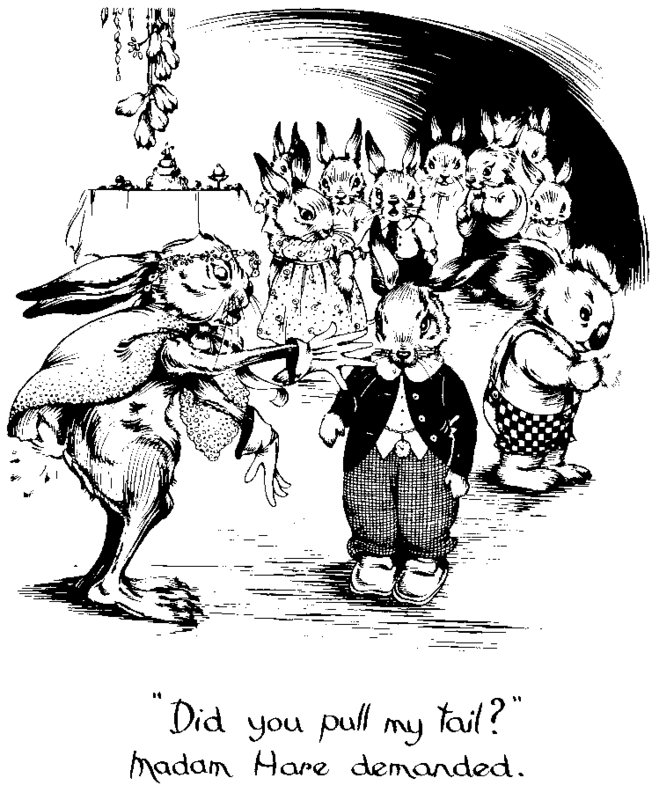 When Brer Rabbit heard her story he at once made for the culprit. 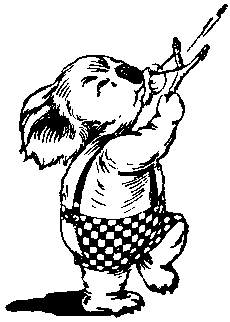 Blinky saw him coming and tried to hide; but Brer Rabbit never moved his eyes from that young bear. Tapping another big rabbit on the shoulder he asked for his assistance and together they grabbed Blinky, firmly holding his front paws. Blinky kicked with his hind legs as hard as he could, but he was handicapped. By this time all the other rabbits had ceased fighting and stood watching the excitement. The orchestra kept playing and an angry note crept into their drumming. “I’ve a good mind to take the young bounder to old Mother Ferrit,” Brer Rabbit exclaimed. Blinky shivered with fear. Madam Hare had such big feet and could give a very big kick. How he wished he had a tail round his hind parts. Scowling and showing her teeth Madam Hare pounced on Blinky. “You’re a bully, and I’m glad I did it,” roared Blinky trying to kick her. “Hold his arms!” Madam Hare commanded, as she turned her back to Blinky; then quickly looking over her shoulder she measured her distance. Blinky waited for the kick. His eyes screwed up tightly and he tried to tuck in the part where his tail should have been. “Thud! Thud! Thud!” Madam Hare certainly forgot to be shy. Roars of laughter came from all the rabbits. “Throw him out! Throw him out!” they called loudly. 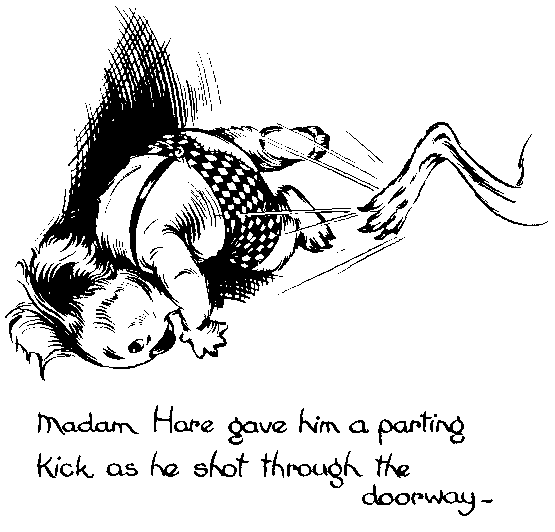 Blinky was pushed towards the opening of the cave and Madam Hare gave him a parting kick as he shot through the doorway. He landed on his paws quite ten feet away. But thank goodness he was safe from the angry rabbits and Madam Hare. He shook himself and gently patted the place where the kicks had struck. “Savage animal!” he called at the top of his voice; and at once a head appeared in the opening. “Chase him! Chase him!” the rabbits cried; but Blinky did not wait to be chased. 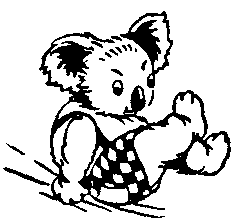 He was running as fast as he could, colliding with corners, bumping his head and snubbing his nose. Panting, he reached the entrance of the burrow; but oh! horror of horrors, Madam Hare’s large feet came thudding behind him. Blinky nearly fainted with fright. He felt quite giddy, and his breath seemed to catch in his throat. His heart pounded and thumped and his legs would not go fast enough. Out into the moonlight he raced, crying and whimpering, stopping just a moment to look behind to see where that Madam Hare was. Now her head came through the burrow and on she raced. “Save me! Save me!” Blinky called at the top of his voice; but he hadn’t the faintest idea who could rescue him. Suddenly the branches cracked and a brown form came hurriedly hopping through the undergrowth. It was Angelina Wallaby. Blinky scrambled on to Angelina’s back as quick as winking, and before he’d settled down safely she gave a hop and away they went. Madam Hare was stupid enough to think she could hop as quickly as Angelina and she plunged through the bushes calling wildly; but Angelina’s hops were too long for her, and very soon Madam Hare gave up the chase. She looked a sorry sight with her stumpy tail showing bone, where only a few hours ago a beautiful white tuft reposed, her whiskers were bent and broken, and her ears hung limply sideways. Her coat, that had taken hours to polish and brush, was covered with dust and tiny twigs, and her eyes were blood-shot. She flung herself on the ground and kicked the dust in temper. If only she could have seen Blinky at that moment, she would have eaten anything that chanced to pass her by, for he was having a beautiful ride, flying along on Angelina’s back—not caring tuppence for Madam Hare and her tail. “Lucky for you, Master Blinky, I happened to be out looking for supper,” said Angelina in between hops. “And what about your mother’s when you arrive home?” chuckled Angelina. “Do you think she’ll be very angry?” Blinky inquired, quite frightened at the thought of it now. “What will I do?” asked Blinky in a whisper. Things must be pretty bad at home thought Blinky when Angelina speaks like that. However, if he was to have a spanking, the sooner it was over the better. Very soon Angelina hopped to the bottom of the tree where Blinky lived. 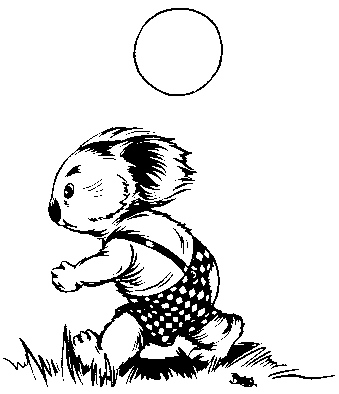 The moon had sunk behind the hill, and the first kookaburra’s chuckle could be heard. A galah screeched in the tree as she looked at Blinky and Angelina. “Stop that noise!” Blinky grunted as he shook his paw at her. Everything was extraordinarily still. 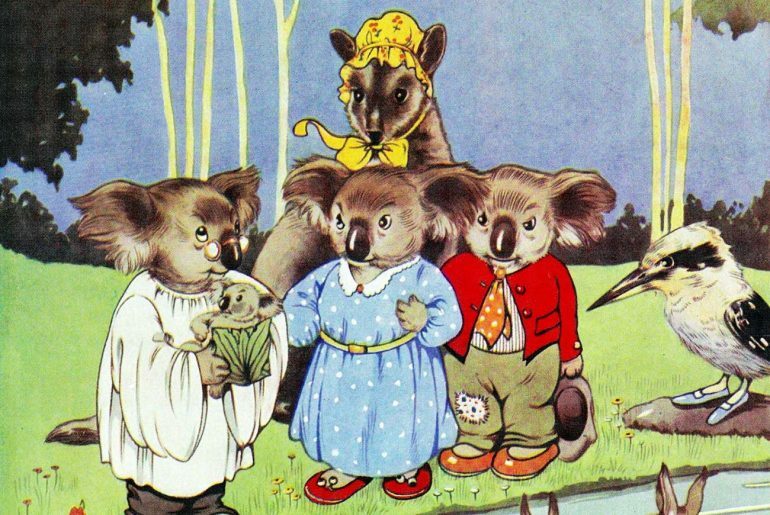 No Mrs Koala was to be seen, no Mrs Grunty and no Snubby. “Good night,” Angelina purred. “Keep sitting if your mother spanks you.” After giving this good advice she hopped away into the bush. Blinky climbed quietly—ever so quietly up the tree. He peeped over the branch where his mother usually slept. There she was, and Mrs Grunty with Snubby too, all curled up together, sound asleep, with their noses snuggly tucked down on their tummies. 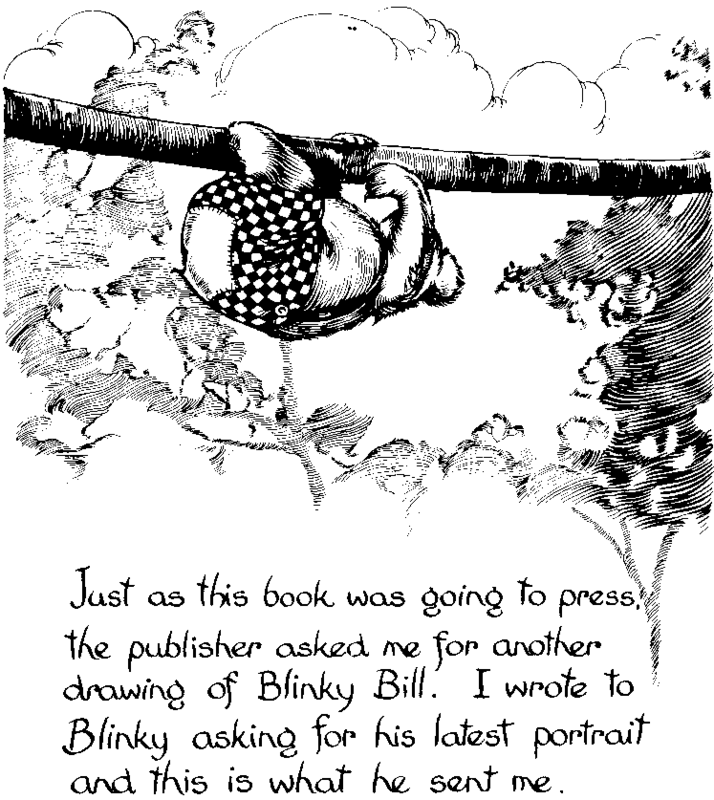 Up past them Blinky climbed, hardly daring to breathe, and he kept climbing until he reached the highest branch, then, too tired to think any more about a spanking, he fell asleep. Peering up among the branches to see if any leaves would tempt her for breakfast, she was astonished to see a furry body that looked very much like her son. “Yes, mother,” came a meek little reply. “Come down here!” she ordered. 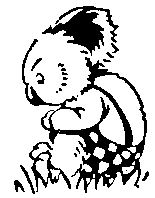 Blinky thought it wise to do as he was told, so slowly climbed down to his mother. “Where have you been?” Mrs Koala demanded. Not Mrs Spotty’s? Blinky asked in a frightened voice. “Looking for some leaves,” Blinky replied, his nose quivering with fright. Blinky had never seen his mother look so angry, so he decided to tell the truth. By this time Mrs Grunty and Snubby were awake and sat staring with eyes of amazement. “Smack him!” Mrs Grunty exclaimed. 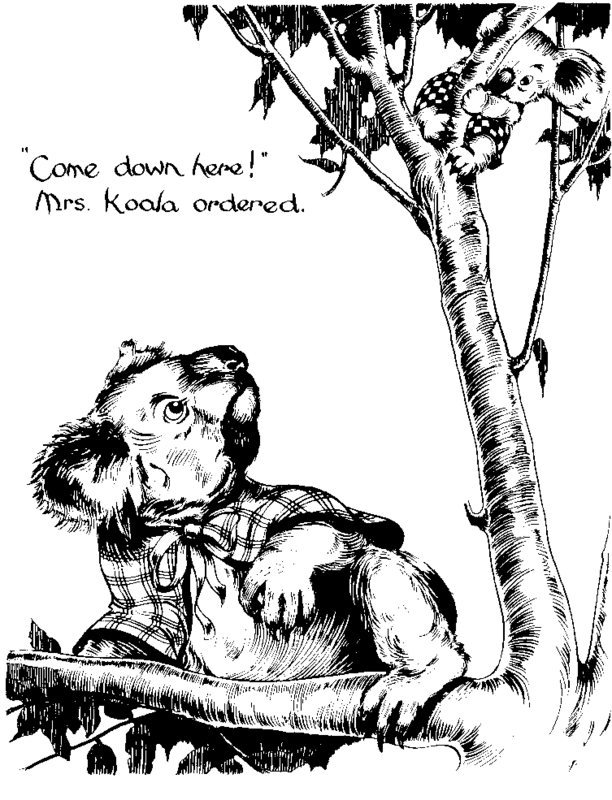 “Wait till I hear his story,” Mrs Koala replied, and she felt rather annoyed with Mrs Grunty, as it was not her business to tell her what to do with her own son. Blinky told his story, keeping several parts to himself, about pushing Mrs Spotty in the pool, and grabbing Madam Hare’s tail. 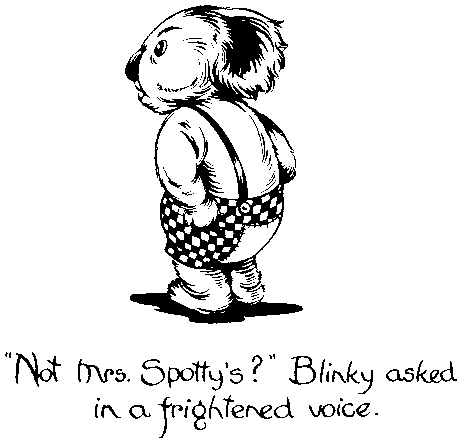 “Not Mrs Spotty’s?” Blinky asked in a frightened voice. 1. This story speaks often about the need to be kind to animals. Why do you think children and adults ought to be kind to animals? 1. 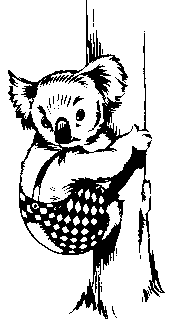 What do you think of Blinky Bill? Do you like him? What did you think of his adventures?